From high street retailers to schools and universities to event organisers, our custom printed paper bags with twisted handles are an on-trend, economical and environmentally friendly way to promote your business and build your brand. Our custom printed paper bags with twisted handles start from a4 size and are made from ethically sourced paper. Ethically sourced, FSC certified, 100 gsm kraft paper. Available in white or natural brown, smooth or ribbed. Spot printing in up to 6 pantone colours and up to 100% ink coverage. CMYK process printed (5,000 minimum order). Come with white or brown handles as standard. A selection of coloured twisted handles are also available at a small additional cost. 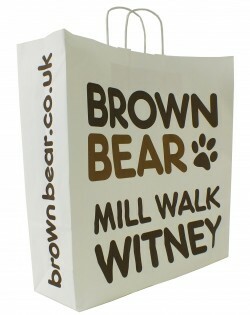 Need your custom printed paper bags in a rush? We’re always happy to try and help. For a small surcharge, we can offer a quicker turnaround. We are more than happy to arrange deliveries to Europe too, please contact us for details.